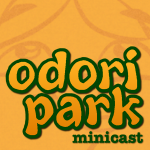 Back again with another new Odori Park Minicast! This here is episode two, subtitled Tunnels & Trolls. If you recognize that name, then get your geek on and get listening! And if you don’t, then you have no idea what horrors await you, so go ahead and click! Yay! More episodes all next week. It’s a podcastraveganza! Back for more, are you? I’m continuing the vacation-induced podcastraveganza with episode three of my brand new Odori Park Minicast! Keep getting the word out if you’re enjoying this. More to come on Wednesday and Friday this week!